Rhythm games have never really been my kind of thing. Looking back to the earliest ones I can remember were games like PaRappa the Rapper and others of it’s ilk and I remember enjoying them for what they were but moved on to a game with more depth quite quickly. Even when the rhythm genre was at its peak with Rockband and Guitar Hero, I just didn’t have the drive (or skill) to pursue playing those games for more then around or 2 and was more concerned with playing pretty much anything else. 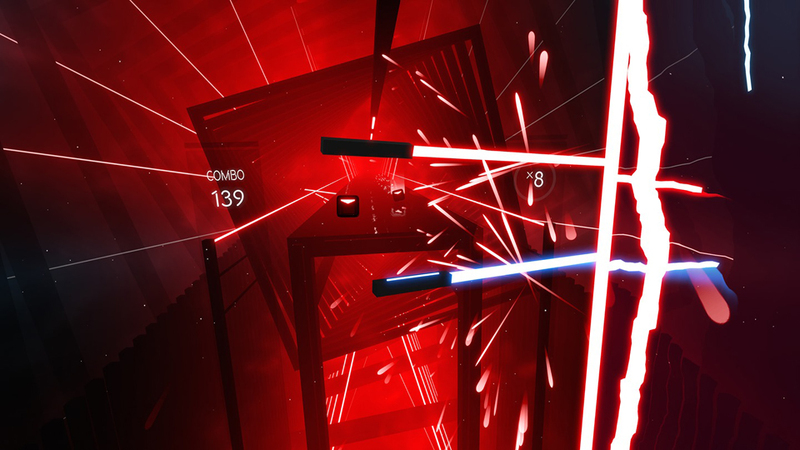 Fast forward to 2018 and we get Beat Saber, a VR rhythm game very much in the vein of those classic titles, but is so much more as instead of just pressing buttons on a guitar or controller ( I know the drums exist too…calm down) you are now armed with 2 lightsabers and must slice and dice your way through incoming beats as they fly toward you from high and low. You are going to need to Move controllers (or other headset equivalents) as the game has you on a platform as square blocks with an arrow on them come toward you. Your job is to slice those blocks in the direction the arrows are facing. Both Sabers have their own unique color so red blocks can only be swiped with your red saber and blue blocks with the blue saber. Depending upon the difficulty you choose and the musical track you pick you may encounter obstacles that need to be avoided by stepping right or left or ducking underneath them lest you lose points or fail. Lastly are some spiked mines which are not to be hit and typically follow very close behind the cubes forcing you to make for more precise swipes. Other modes for all the headsets are Party Mode, which let’s you customize the game to make it available to a more casual audience by removing the option to fail or taking out the obstacles and allowing local players to compare scores. Single Saber only gives you one weapon, removing the color coordination aspect of the game, but ramping up the pace you need to react as you still have to hit the same number of blocks (more or less). The last mode is No Arrows, which seemed foolish to me as you can now just swipe at the blocks in any direction you want, drastically reducing the challenge in a stage. As it turns out this mode is absolutely great at just letting you unleash and I realized in this mode that the way I naturally moved to swipe these blocks is echoed in the regular stages and improved my ability to anticipate which swipes would be needed next. Minus single Saber Mode, each other mode can be played across 4 difficulty levels ensuring that anyone of any skill can easily hop in and play. There are truly some epic moments in here! That’s all the content available across all versions of the game, but those with the PSVR headset get a few extra timed exclusives that the devs have confirmed are coming to all versions of the game at some point down the road. This content includes a campaign that carries you through the tracks with varying difficulties, modifiers and challenges including arrows that disappear, forcing more dramatic movements, chaining a specific combo number and a ton more modifiers that keep you on your toes! Also available are 5 additional songs on top of the 10 featured in the early access version of the game, which is great, especially considering that the PSVR version cannot use custom content via mods. There are also a few extra level modifiers as well that increase the replayability of the game s and a practice mode, which lets you pick any stage at any point to try and master it without the pressure of being graded or failing. Assuming you are just playing the base game then the PSVR version is the way to go and while this content will be available to everyone eventually, having it now just makes the PSVR version that much sweeter. Beat Saber looks absolutely fantastic on any headset, but is also an incredibly simplistic game. Pretty much everything is outlined in Neon blues and reds with your Sabers glowing as if they were taken right out the Star Wars universe, though on the PSVR side, their appearance has been changed to look more hollowed out. Slicing blocks cuts them in the direction of your swing with obstacles(walls) to avoid coming at you in a green hue. 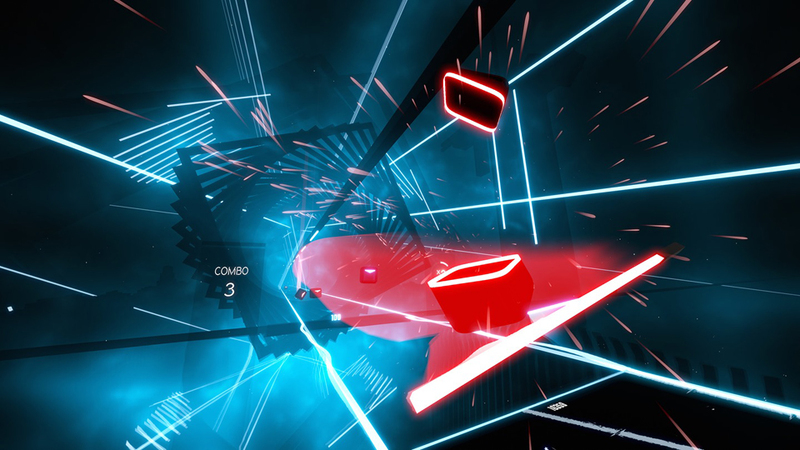 The background and lighting are affected by the song playing with lasers and other distractions popping up as the you progress through each track. Every time your sabers hit anything, sparks fly and everything here is crisp and clear with the simplicity of the visuals and color palette making for a game that looks absolutely striking on any headset. As I said, there are 10 to 15 tracks to choose from, depending upon which version you buy, and while they all won’t appeal to everybody, for the most part they are catchy as all heck and contain some great upbeat electronic songs that fit the visuals perfectly. 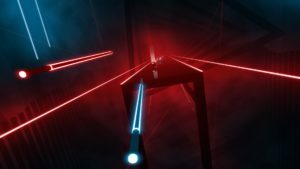 For everything Beat Saber does right, it still needs a bit of work, or rather, content. As I said earlier, The PC version of this game can be modded to bring a ton more tracks, but the base game, even with 15 tracks still feels light. The first batch of paid DLC has already been confirmed (once again a timed exclusive for PSVR) which will apparently bring the total track count to 25 but even that isn’t enough. 25 is a good starting number of tracks and I’m enjoying play through the songs available multiple times, but to sustain interest, Beat Games is going to need to add additional songs often. Even with all the modifiers and modes available I want more, just to keep this game feeling fresh. It’s insanely replayable and even if no more content came to the game, the amount of time I’ve squeezed out of what’s available still gives Beat Saber a ton of value. With the Rift I encountered no tracking issues at all, and the PSVR tracks just as good, but those playing on the Sony headset need to be aware of the area tracking limitations of the PS camera and I found myself on a few occasions hitting that invisible wall where my controllers were no longer detected and I had to re-center myself to the camera. Like I said, the tracking is near flawless on either headset, but in a game as physical as Beat Saber, it can be easy too go out of bounds in PSVR so just be aware of that. Both of those issues I mentioned above are valid and should be taken into account before you purchase the game, but those same issues are rendered almost completely moot by the fun factor here. 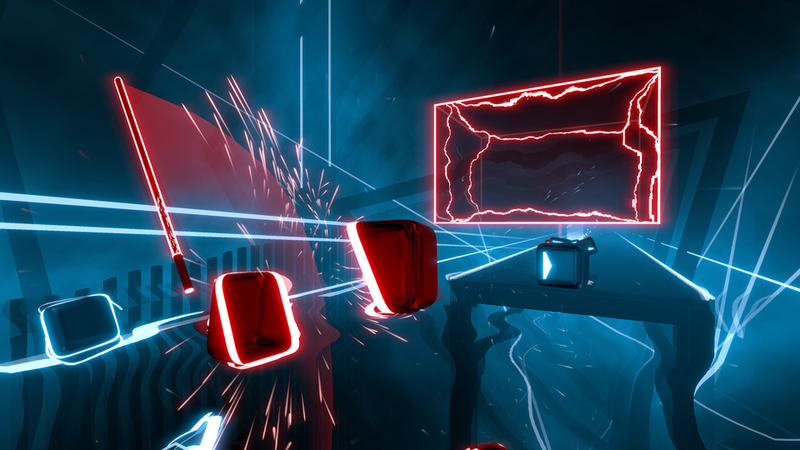 As I said, I have never been into rhythm games…until Beat Saber and now I’m hooked. I’ve played through every track on every mode and while my skills still need a lot of work to master the harder difficulties, I can’t wait to get back in and play again. 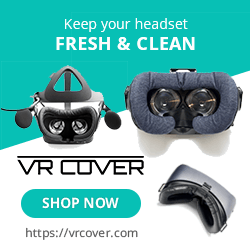 This is one of the most addictive games I have every played and could not work out of VR making this a special treat for those of us who invested in these headsets. What would I pay? It’s $20 for the PC version and 30$ for the PSVR version and while the PC is the better deal thanks to custom mods, the PSVR version is still worth the asking price. I can’t get Beat Saber out of my head and it’s now in the top 3 games that I HAVE to demo to people curious about VR and is phenomenal in almost every way that matters. It’s a game anyone can pick up and play and I think it’s next to impossible to not like this game. Even if you dislike the soundtrack you can’t dislike the gameplay and it fits so well with the music that I think it’s impossible not to get in the groove!